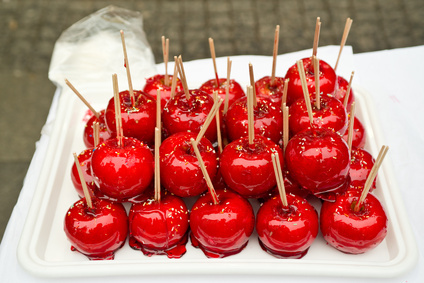 Tis the season for Toffee Apples but don’t they just seem so expensive? Have a go at making your own this year instead. Insert lollipop stick through the centre core of each apple. Heat up water, sugar and golden syrup over a medium heat until it reaches 154°C on a sugar thermometer, remove from heat and, if using food colouring, stir it in now. Dip and coat each apple into the syrup, coating as evenly as possible. Take care and DON’T be tempted to lick any drips – it’s extremely hot and painful. Stand each coated apple top-side down on greaseproof paper until the syrup has cooled and hardened.